Stephen Curry and Austin Rivers have known each other’s games well for years, but they’ve gotten to know each other on a more personal level. Reason being, their siblings are engaged to be married next year. Two of the NBA’s most well-known and successful families are now actually one big family. Before the Golden State Warriors’ game against the visiting Houston Rockets on Jan. 3, the guards shared a laugh as they talked about the recent union of their families. Seth is Portland Trail Blazers guard Seth Curry, who is marrying Callie Rivers. Their dads, of course, are former NBA stars Dell Curry and Doc Rivers, who played against each other in the late 1980s and early 1990s. 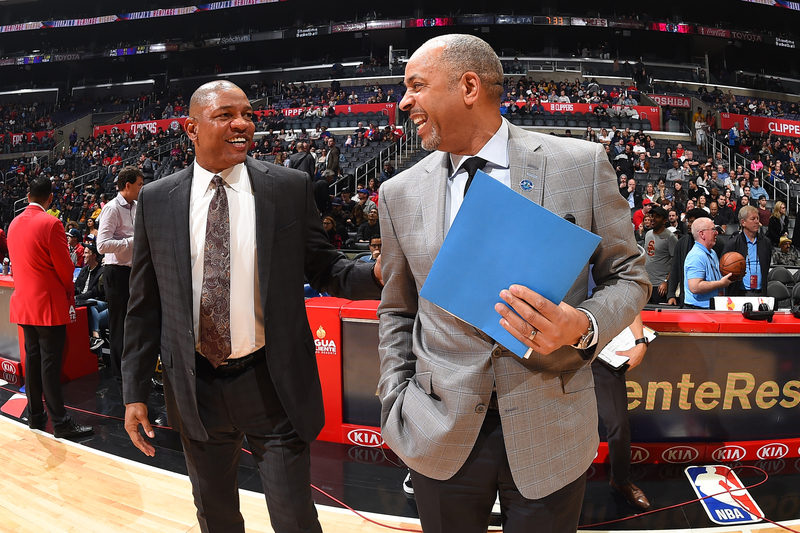 L.A. Clippers coach Doc Rivers (left) greets Dell Curry before a game between the Clippers and the Charlotte Hornets on Jan. 8 at Staples Center in Los Angeles. Stephen Curry echoed the sentiment about the connection. Duke guard Seth Curry (left) and guard Austin Rivers (right) wait for the start of play after a timeout in the first half of an NCAA college basketball game in Lahaina, Hawaii, on Nov. 23, 2011. Austin Rivers and Seth Curry, meanwhile, were teammates at Duke during the 2011-12 season. Both families got more familiar with one another at those games. Austin said his mother, Kristen Rivers, and Seth’s mother, Sonya, started building a friendship at that time. Austin Rivers said he was initially skeptical when he heard his sister was dating an NBA player. But when he found out it was his former college teammate, his feelings changed. Before proposing to Callie, Seth Curry asked Doc Rivers if he could have his daughter’s hand in marriage. The Los Angeles Clippers coach enthusiastically said yes. 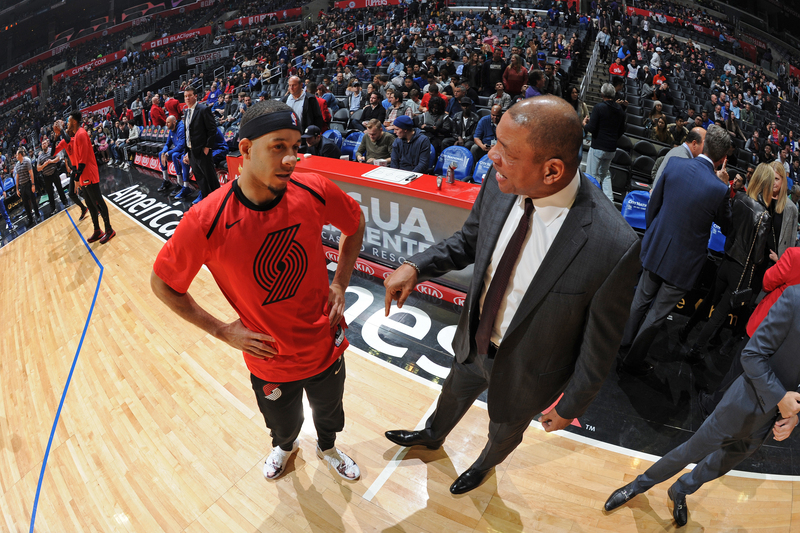 Seth Curry of the Portland Trail Blazers (left) speaks with coach Doc Rivers of the Los Angeles Clippers before their game on Dec. 17, 2018 at Staples Center in Los Angeles. Seth, who said he was “a little nervous” about his conversation with Doc, asked Callie to marry him while at a friends and family dinner in his hometown of Charlotte, North Carolina, on Feb. 14 during NBA All-Star Weekend. She said yes. When did his big brother know he was going to pop the question? When reflecting on that, Austin Rivers said he recently told his fiancée that all of those kids will have a lot of pressure on them to be great basketball players because of their family pedigree. Stephen Curry and the Warriors will compete against Doc Rivers and the Clippers in the first round of the playoffs. Austin Rivers and the Houston Rockets will face off against the Utah Jazz. And Seth Curry will be making his first career playoff appearance as the Blazers play the Oklahoma City Thunder. Two Currys and two Riverses are fighting for the NBA championship. “Me, Seth, Austin, the whole crew, it’s pretty cool to keep tabs on everybody,” Stephen Curry said.